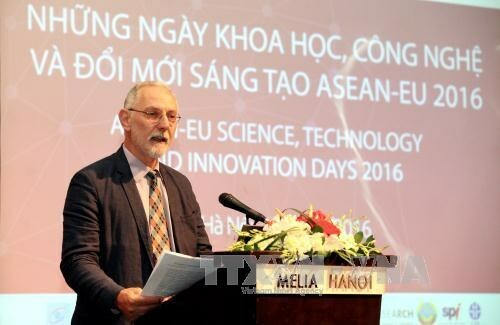 Hanoi (VNA) – The Vietnam-European Union (EU) cooperation in the science and technology field is auspicious, according to Kostas Glinos, Head of Unit for Strategy on International Cooperation under the European Commission’s Directorate General of Innovation & Research. Addressing a press conference on the EU-ASEAN Science-Technology and Innovation Days in Hanoi from October 10-12, Kostas Glinos said while the EU encourages cooperation with Vietnam in all fields, special attention is paid to health care, fishery and irrigation. He noted that as one of the world’s largest partners in research and innovation, the EU has launched its biggest Research and Innovation programme ever, Horizon 2020, with a fund of nearly 80 billion EUR for 2014-2020 period. According to Glinous, currently, more than 100 organisations and research establishments from Vietnam have been working with the Horizon 2020 programme, with projects focusing on bio-diversity preservation, waste treatment and poverty reduction.